After two (!) years my last PhD-related article just went online! It’s been published by the popular online journal First Monday, which is – normally – known for a quick review process. But well, good things take time, as the saying goes. Since my PhD “Mediated Knowledge” (download here) deals with the computer-mediated communication of online health information you may ask whether the article is not outdated by now. That’s what I was asking myself, at any rate.. But the answer is no. Even though the empirical data may seem quite “old”, and Web 2.0 health communication has become more widespread in the meanwhile, the base line of my arguments – the “politics of online health information” challenging the democratic ideal of the web – is still valid and more relevant than ever (not least because Google managed to further enlarge its market share and hence influence over online knowledge since then). Got interested? 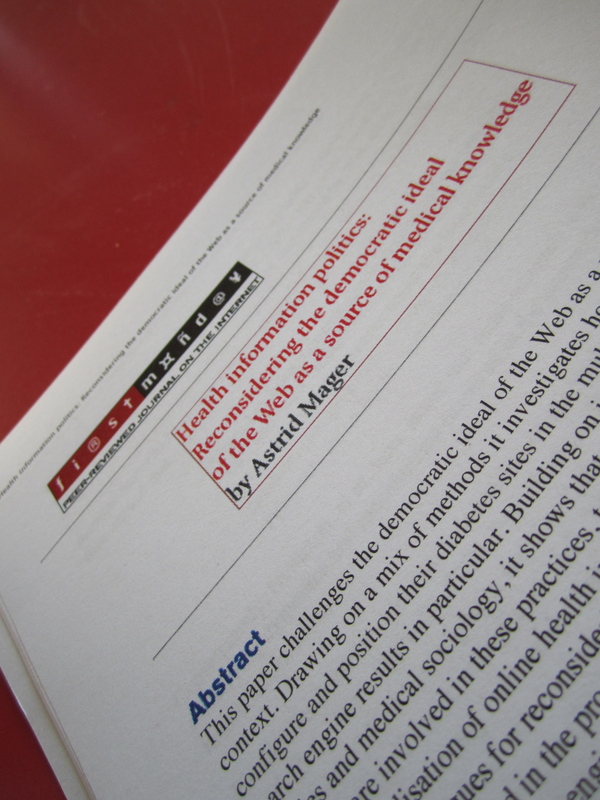 Then check out my article “Health information politics: Reconsidering the democratic ideal of the Web as a source of medical knowledge” on First Monday and decide for yourself! Thanks go to my HUMlab colleagues for their helpful comments on earlier drafts of the paper, Mike Frangos first and foremost!!! This entry was posted in publications and tagged Google, online health information, PhD by astrid. Bookmark the permalink.